Product #16359 | SKU ECM77B | 0.0 (no ratings yet) Thanks for your rating! 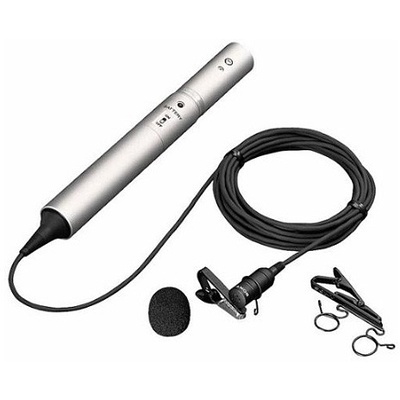 The Sony ECM-77B is a miniature omni-directional lavalier microphone designed for professional broadcast, sound reinforcement and recording applications. The condenser element features a miniature profile allowing it to be easily concealed in performance and broadcast situations. The omni-directional pattern provides even frequency and sensitivity response at the direct and off-axis sections of the microphone capsule. The ECM-77 provides a wide frequency response of 40Hz - 20kHz. The wide frequency response enables the microphone to accurately reproduce audio signal from a wide variety of sources. The ECM-77B is powered with an external 48 Volt phantom power source or AA alkaline battery. The ECM-77B is manufactured with a variety of connectors to accommodate various input devices, this version features a standard 3-pin XLR male connection. The omni-directional pattern provides even sensitivity and frequency response at the direct and off-axis sections of the microphone capsule. The ECM-77B is powered with a single AA alkaline battery or external 48 volt phantom power source. The miniature, unobtrusive profile enables the microphone to be easily concealed in broadcast and performance situations. The ECM series is available in a variety of connections, this version features a standard 3-pin XLR male connection.